On special this week, we are featuring an 8 oz. boneless chicken breast baked with a garlic chive butter. 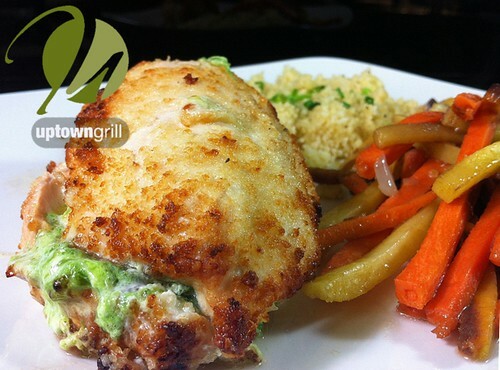 You may have heard of this dish before: Chicken Kiev. This fresh baked chicken breast is served alongside cous cous and tri colored carrots with shallots in a light maple glaze. There are so many different dishes that can be made with chicken; however, only a handful stand out as classics. While Chicken Cordon Bleu (stuffed with ham and swiss cheese) and Chicken ala King (a rich chicken dish made with cream, pimentos and sherry) are obvious favorites, the Kiev is one that definitely stands out! It remains widely popular in both restaurants and as a simple dish to create at home. Stop down and try our version of this classic! Also known as "chicken supreme," Kiev as a method of preparing chicken gained fame when Nicholas Appert created it several hundred years ago back in the mid 1700's. Although the dish is often mistaken as originating from Ukraine (its capital is Kiev), it was actually created by a Frenchman. Whenever you think of excellent cuisine, France always seems to come to mind, and Nicholas Appert was the jack of all trades in the kitchen. Not only a chef, he was a confectioner, pickler, and brewer. He is also responsible for many of the early principles of canning and preserving food. These principles have done wonders for food preserving and preparation. His signature dish is what took hold across the world. Back when created, the Empress of Russia was fond of French cooking and would often send cooks to train in France. This may be in part why it was named Kiev. Call it what you wish... all I know is that this "chicken supreme" is here for a short time only. Stop down and take a bite of history!